Lower center (with date): "1631 / Adr:v:Venne"
Verso, in graphite: "By Adrian Vander Venne / Scholar of van Deist/ 1589-1602 / Signed and dated 1631"
A bent, old woman carrying a cat leans forward to take a quick puff on the clay pipe offered to her by a bearded man. The man's belly protrudes into the center of the scene, almost touching the woman's hand. Bagpipes, often used to symbolize sexual prowess, hang from his belt. In the background, a boy pats a dog while an older man taps on the old woman's shoulder. The single flame of a lamp and a crescent moon that peeps out from behind the clouds are the only sources of illumination in this night scene. 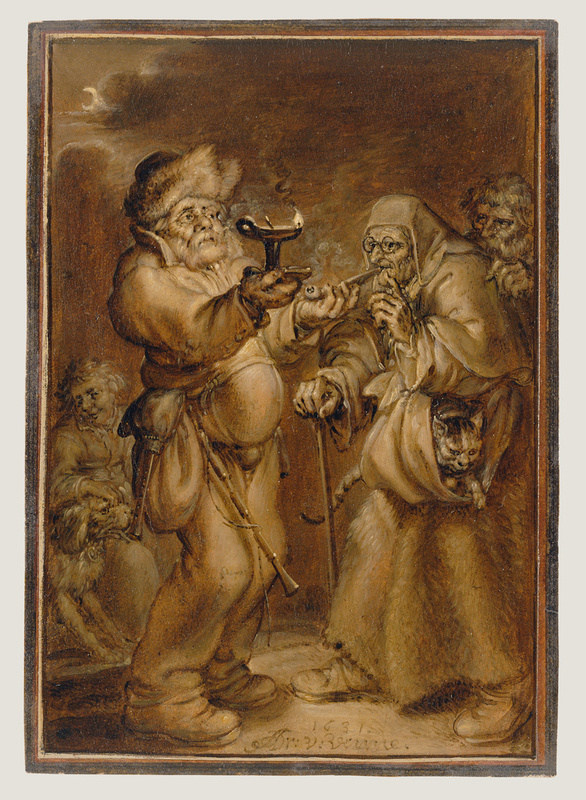 Adriaen van de Venne used sharp contrasts in lighting to emphasize the deep creases in the bearded man's face, his grubby hands, and the coarse wool of the elderly woman's skirt. Possibly David Gavin, Scottish, 1720 - 1783, by inheritance to his son-in-law, John Campbell, first marquess of Breadalbane. Possibly John Campbell, first marquess of Breadalbane, Scottish, 1762 - 1834, by inheritance to his son, John Campbell. John Campbell, second marquess of Breadalbane, Scottish, 1796 - 1862 (Taymouth Castle, Kenmore, Scotland), by inheritance to his sister, Elizabeth Maitland Pringle, 1862. Elizabeth Maitland Pringle, Scottish, 1794 - 1878, probably by inheritance to her daughter, Mary Gavin Pringle, 1878. Probably Mary Gavin Baillie-Hamilton, Scottish, 1832 - 1912 (Langton House, Duns, Scotland), probably by inheritance to her sister, Magdalen Bateson Harvey, 1912. Probably Magdalen Bateson Harvey, Scottish, 1836 - 1913, probably by inheritance to her great-nephew by marriage to Sir Robert Bateson Harvey, Thomas George Breadalbane Morgan-Grenville-Gavin, 1913. Probably Thomas George Breadalbane Morgan-Grenville-Gavin, Scottish, 1891 - 1965 (Langton House, Duns, Scotland), by inheritance within the family, 1965. Bob P. Haboldt, sold to the J. Paul Getty Museum, 2001. Sotheby's, Amsterdam. Old Master Drawings. November 8, 2000, p. 24, lot 29, ill.
Haboldt & Co., New York. Northern European Old Master Drawings and Oil Sketches, 2001-2002 (New York: Haboldt & Co., 2001), pp. 58-59, no. 25, ill.